The central weights, A, each weigh one-fourth more than the weights, B, at the extremities of the arms. 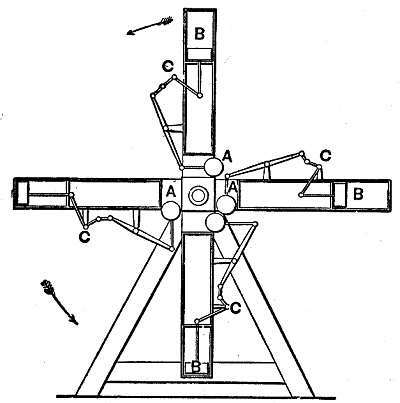 The two sets of weights are connected pairs, each pair being joined by a lever, link, and bell crank C. The action of gravity in the central weights compels the sliding weights at the ends of the arms to assume the positions shown in the engraving. Had this inventor applied a little mathematical calculation to the verification of the truth or falsity of the principle of his device, he might easily have proved that it was a perfect balance, and saved himself both trouble and expense. The leverage of the outside is exactly counteracted by the leverage of the inside weights.